For a Pokemon Emulator, it is especially important that it correctly supports the RTC - Real Time Clock function needed for time-based events in Pokemon games. Otherwise, you will not be able to catch nocturnal Pokemon that come out only at night. And it is imperative that Link cable emulation function for trading in Cable Club works as it is no fun playing alone. Pokemon Black: It Was Worth the Wait - After a long wait and much expectation, Pokemon Black Version and also White is finally here. Pokemon Black review writers have generally been positive about it, pointing out that it is everything that old-time fans have been asking for in a Pokemon game while still being accessible to new players. Considering that there are now close to 500 varieties of Pokemon, this makes successfully completing the game easier, but capuring all creatures harder. Play Nintendo NDSi Games on PC, Mac, PSP etc. One improvement in Pokemon Black that makes it more accessible is that although gameplay is not substantially different from past releases, involving the collection of Pokemon and winning Gym Badges, engaging in Pokemon battles and facing the Elite Four at the end of the game, Pokemon Black and White initially features only new Pokemon. Only when you finish can you start importing old Pokemon on repeat playthroughs; so if you miss Pikachu, don't worry, you'll see him again. Pokemon Black emulator version also looks better than past releases, as the 3D settings in DeSmuME DS emulator and No$GBA NDS emulators seem more fully realized this time around. The new land of Isshu, where the game takes place, is also more industrialized than past settings, providing the enjoyable novelty of seeing Pokemon walk around a city for the first time. Adding to the replayability value of the game, Isshu changes seasons every calendar month so that you'll be constantly encountering different Pokemon and landscapes, and can even access different areas depending on the season. Pokemon Black reviewvers pointed out that these changes have helped revitalize the franchise, making the new releases seem fresh even to seasoned Pokemon fans. In short, Pokemon Black and White is the game that fans have long been demanding, and which Nintendo has finally given them. No$GBA Nintendo DS Emulator with multiplayer linking support for trading Pokemons from one rom to another. DeSmuME NDS and DSi XL emulator that is compatible with the latest Poke games. Despite how great Pokemon Diamond and Pearl are, their concepts do not seem enough. They just seem to be checking how the gamers would respond to it and what they would like more from the game. 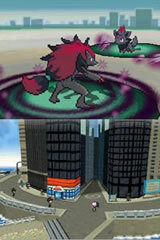 This is the result of the developments done by Gamefreak. There were already Pokemon games before that showcased some 3D capabilities, a hint of what the game is capable of delivering. Pokemon Black now has full 3D features. The game though is slightly reminiscent of Super Paper Mario due to the same effect that both games has on the player – that feeling of confusion upon seeing that everything is already very visible on the screen. However, the game’s control aspect is easy to adapt. There are also seasonal applications which can only be used depending on certain seasons. This is a more dynamic game compared to the older games from Pokemon. If you are already used to playing this game, which should only take an hour or two, you will likely be bored with the other games because they would seem too static compared to this one. Moreover, the game developers also gave new abilities to your Pokemon which were not available in previous games. This should be expected to change the online gaming community. Download Pokemon black Nintendo DS and 3DS Emulator for playing PoKeMoN games on Windows PC, Mac, iOS and devices running Android. Touchscreen is optional. Of course, the gameplay is the most important part. But first a disclaimer: I have yet to try the new online features. Dream World is back online after its temporary crash, which is good news for avid gamers. Hopefully, these issues don't happen whenever a new Pokemon version is released since it can be such a bummer. First, the issue regarding the Isshu region itself. In comparison with the regions from White version's predecessors, Isshu has a very flat, linear and two-dimensional quality to it. What does this mean? For one thing, you can't move on to the next level unless and until you have defeated the gym leader in one town, which means that there are no skipping the gyms, as was the case in Kanto. This was such an annoying feature especially when I wanted to avoid the town's gym in order to catch a wild Chiraamii before coming back to the gym and deal with the Pokemon there. Instead, winning each gym battle is a must to unlock the next step. Before you launch into a tirade of your own, it must be said, nonetheless, that this is a relatively minor issue since the goal here is the effective use of a wide range of Pokemon species to progress in the game. For example, after you arrive at the first gym, you either only have your starter Pokemon – Choroneko or Youterii – or your monkey, which can be Hiyappu, Yanuppu, or Baoppu depending on your choice in a starter, to choose from; perhaps it will be Tabunne, in case you're lucky although you shouldn't count on it. After defeating the gym leader, you will get the option of using a few Pokemon, such as Koromori or Munna, until you arrive at the next gym – and the cycle continues. If it wasn't for this new feature, I wouldn't even think about using a few of the pocket monsters and, thus, learned about the strengths and weaknesses of the Isshu Pokemon. Second, the issue of limited utilization of HMs throughout the new region. You will only require Strength and Surf, perhaps Cut at least once, in order to beat the game. I actually love it because my Water Type Pokemon will no longer be bogged down by the HMs for every move set as well as reduced the requirement for an HM servant. These things just feel such nice additions to the game. Just keep in mind that you may not need the other HMs in beating the core game but you will still need the other HMs, specifically Dive and Waterfall, in successfully accomplishing the various post-game things. And then there are the battles. If you have played the DPPt/HGSS, you will agree that everything's the same on several levels although including the absence of new battle features. There are exceptions, nonetheless, including the Rotation Battles and Triple Battles, which will be discussed in the following sections, as well as the Physical and Special split from the fourth generation. But there appears to be a change in the RPG's hidden aspects, such as the method for calculating EXP and the like. While I have little idea about it now since these elements are usually found in the games' programming, I'm interested in seeing the implementation of the hidden features. Let's proceed to the new elements in the gameplay. First, the new moves introduced in the game were nice additions although a few of these moves, such as TM76 or Bug Resistance, were slightly unnecessary all things considered. But for the most part, every new move should be seriously considered for its worth especially as many of them hold such a high value. Gamers should also look out for updates to old abilities and moves although many of these updates usually have minor impact on the Pokemon's accuracy, power and effect. The new abilities introduced in the game are also interesting aside from the fact that each Pokemon was designed with a different power than what it usually possesses in Dream World; this statement is based on Internet sources since I haven't explored the online elements yet. The C-Gear also sounds and looks cool. I must say, however, that I still have to acquire sufficient experience in the C-Gear but from what I've read, it's among the coolest features on the new game. Let's proceed to the topic avid gamers want to hear more about – the Triple Battles and Rotation Battles. Sadly, the game designers of the Black and White versions didn't use the core idea behind these battles to its fullest expression. The three Triple Battles I've participated in were actually such fun that I will surely be participating in more of them! Basically, you will simultaneously engage three of your Pokemon into battle for a Triple Battle. Your Pokemon are placed in a horizontal line with each Pokemon only able to directly attack the opponent in front of them or the enemy in the middle. Keep in mind that the pocket monster in the middle will suffer more damage although emphasis must also be made that it can attack any of its five opponents. In a Rotation Battle, the three pocket monsters are arranged in a different order – a triangular formation of sorts where the Pokemon in front (i.e., the active Pokemon) has the advantage. This is because it has the capacity to carry out an attack against the opponent while the other two Pokemon are in standby mode. You can rotate the active and standby status of the three Pokemon depending on your strategy for the battle. While my worries centered on the battles being cluttered and confusing, the game designers pulled off the battles nicely while also adding a great strategy – the battle positions are different in the Triple Battles and Rotation Battles. But since I wasn't able to participate in many of these battles, I may be unfair in my judgment although I'm hoping that there are more of the Triple and Rotation Battles, as I also did for the Ruby and Sapphire versions when the Doubles Battles were introduced. Also, I didn't have the opportunity to use any of the combo moves since I'm only aware of the three “Oath/Vow' combinations through the starters. The game designers should either have completely scrapped these elements or added more of them. Finally, let's discuss the version exclusives, a smaller topic in the general scheme of things. Every Pokemon version so far offered its gamers with the typical version exclusives but in the Black and White versions, new ideas are introduced. First, the well-known White Forest or Black City areas have been placed in the game with each one having a corresponding color in its name, not to mention that you are only visit the area corresponding to your version of the game. In each town, you will find different people to interact with, different things to do, and different places to see. While these maybe different, you shouldn't get too excited as it's not that much different. For example, in the Black version, you can purchase rare items while in White, you have to find the hidden items in each town; items in the White version re-spawn on a random basis so there's no need to worry. In White, you also have the opportunity to battle with and capture wild pocket monsters from the older versions while in the Black version, the trainers have the Pokemon for fights. The final verdict: You should give the Isshu region a try! You will likely find, as I did, that playing the Pokemon White game was such an enjoyable experience that I'm looking forward to its English release and, thus, give it another go.